From customizing plans to installing eco friendly utilities, you can find your tiny house checklist here. 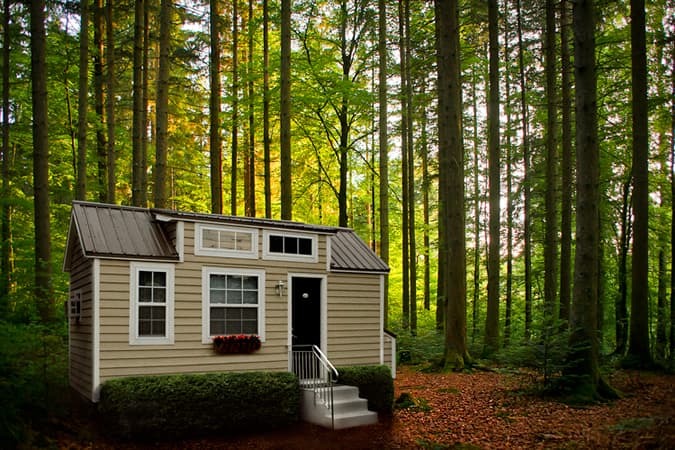 As tiny houses have become more popular, the online community has grown with it. This includes tiny home designer and builders who are looking to help other homeowners that want to move toward tiny living. Many of these sites include catalogs of premade tiny house plans that you can buy and download for personal use. These plans are particularly helpful if you’re not sure where to start when designing your own tiny house. They are typically complete designs that you can build as is, but you can always customize a tiny house plan to cater to your lifestyle. If you decide to take the tiny house plan as your final plan, you can either hire a builder or decide to build a complete DIY tiny house. Depending how your dream tiny house, there are a few different materials you can use for the structure of your tiny house. The purchased tiny house plan may include the materials that would best work with your design. However, depending on different lifestyle considerations, such as eco-consciousness, you may find that other materials work just as well. The plan doesn’t have to dictate your tiny house design, but just be a guiding hand. When looking at a predetermined tiny house plan, don’t be afraid to adjust the proportions of different areas of the home. When you downsize your floor plan, you can’t have the full size separate rooms that you would have if you were living in a traditional home. Think of your lifestyle and where you will be spending the most time when making adjustments to the house plan. For instance, if you enjoy cooking and spending time in your kitchen, you may want to take a little bit more square footage for full kitchen appliances and have a more strategic smaller seating area. If you love the idea of designing your own tiny house, but are intimidated by the thought of having to go through a building process, consider a renovation. With the focus on the interior, you can put all of your energy into maximizing space instead of stressing out about building materials. A tiny house renovation can range from replacing your tiny house stairs to completely gutting your home and starting from scratch. Whether the case may be, there are plenty of tiny homes that are looking for a new design! While a tiny home itself may seem untraditional, there are plenty of designs that are simply a traditional home in a smaller scale. These traditional type tiny homes usually come in the form of cottages or trailer frame houses. They have the standard pitched roof and can be described as quaint. The trailer frame homes are the most recognized tiny home type. They are a popular option for prefabricated houses because they can be hitched to a truck and moved with the homeowner. 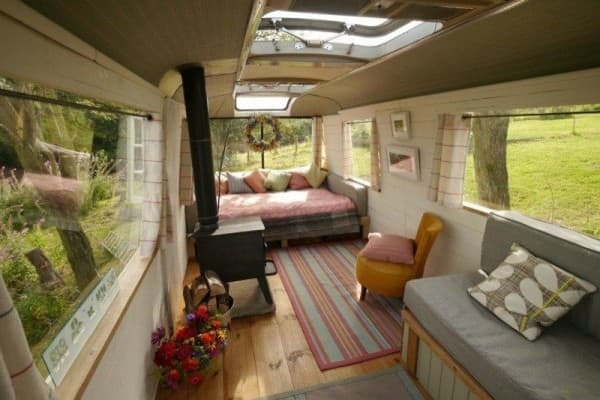 Another more traditional option is to take an old RV and completely revamp the interior for full time living. There are just as many if not more unconventional housing options for your tiny house designs as well. For a modified RV design, you can buy an old school bus and completely strip the inside to create a one of a kind home. If you want to buy the blank canvas and work from there, a shipping container is a great option. you will have to do some more work on the interior With the nontraditional tiny homes, including your floors and insulation. Your tiny house’s interior design should always be focused around your lifestyle. This is no different designing a traditional home. You want to be comfortable and love your living space no matter what size it is. Depending upon what type of tiny house you have, it may lend itself to specific interior design styles. A popular interior design style for tiny homes is a cozy rustic home design. Because so many tiny homes feature wood paneling and organic materials, they are the perfect space for a rustic home design. If you want a more updated tiny hey ouse, modern and minimalist home décor styles are perfect for small spaces. They both utilize open spaces and light colors which can help your tiny house to feel bigger. When you’re designing your own tiny house and look for inspiration, you’re probably going to find that most tiny house designs have a loft of some kind incorporated into their home plans. A loft is the perfect solution to needing more space, but not wanting to build a larger home. By creating a usable loft, you can create square footage in your home. Some tiny homes choose to use two lofts instead of the standard single loft to create even more living space. Depending on how you choose to use your lofts, you can connect the two with a small platform running above the common living areas below. The most common function of a tiny house loft is a bedroom loft. It may seem like a job for a contractor, but turning a loft into a bedroom can be an easy DIY tiny house project. The biggest part of your loft bedroom design is to ensure that you have enough head room to comfortably use your loft on a regular basis. The right furniture can give you extra storage space in your bedroom loft as well. There are plenty of bed storage options that range from simple drawers in the frame to hydraulics that life the entire mattress for storage space. Loft stairs are another important aspect of your tiny house design. Because staircases typically take up a large amount of space, tiny house stairs need to keep the space constraints in mind. Tiny homeowners want a stair design that is both compact and safe. Because many people are starting to look to tiny homes as a retirement option, a tiny house stair should have a universal usability. With all of these things in mind, the first stair design that you think of is probably a traditional straight stair. Homeowners know that this stair design is safe and stable. However, traditional stairs have a very large footprint and will take up all of the space that you created by installing a loft. While ladders have a small footprint, they’re not practical for older family members or pets. A spiral staircase gives you a small footprint with the stability and safety of a large traditional stair. The spiral design keeps your stair’s footprint to a small circle in your tiny home. The smallest diameter available is a 3’6” which keeps the footprint to 42”x42”. If you’re concerned about how much space it will take up in your tiny house, tape off the area for a few days. Once you’ve lived without the space, you can adjust your spiral staircase design accordingly. A call to one of our consultative designers can also help you to find the best size and design for your space. You can easily find a spiral stair that fits in your home décor style. A Classic Steel spiral stair has the flexibility to fit in just about any floor plan. The all steel frame can fit into an industrial space, while the addition of wood steps makes it a more rustic design. The Forged Iron spiral stairs fit seamlessly into a Victorian or Traditional style tiny house. The spindles have ornate scroll designs and compliment the solid wood handrail and steps. For a simple rustic design, you can also install a Solid Wood spiral stair. The installation is another easy DIY tiny house project. Salter Spiral Stair ships your staircase to you broken down into kit form for easy transportation. Once it’s delivered, your spiral stair goes together like a large erector set. It can be installed over the course of a day with the help of a spouse, friend, or neighbor. Every homeowner is always looking for more storage space in their home. Most people decide to use their basement or an attic. However, if you’re designing your own tiny house, you’ll have to be a little more creative. With square footage at a premium, you don’t want to take up any more floor space than you need to. 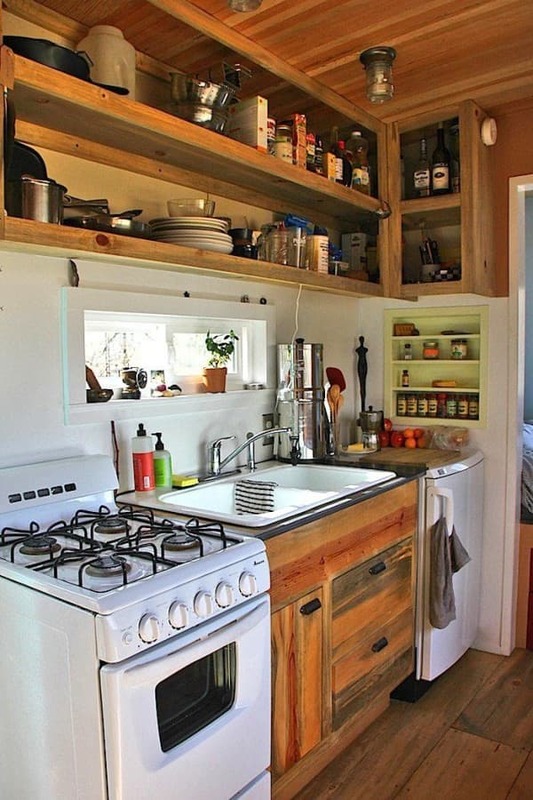 One of the best ways to maximize the space in your tiny house is to avoid clutter. Because your home is already small, clutter can quickly overwhelm the space and make it feel even smaller. Organization and effective storage can help your home feel larger and calmer. You can keep the storage simple without any major renovations. The key is to keep your space feeling open. Open shelving is a trendy storage solution that keeps the flow of air and light even throughout your tiny house. To maximize your floor space, you can build the shelves into the wall. By keep the shelves in shallow alcoves, there is nothing impeding movement around your living space. If you want to keep your items out of the way, there are plenty of hidden storage ideas. The first, and most popular, is to use multifunctional furniture. Storage furniture is a popular way to use your storage spaces as functional parts of your home. Storage ottomans are one of the most common ways to incorporate these designs. Not only do they provide extra seating and storage when needed, but they are also small enough to be tucked out of the way when they’re not in use. Another hidden storage idea is to use a trap door storage technique. This is done by building small compartments into the floor of your tiny house. It keeps your storage out of sight and keeps the actual living space open. You can take your storage out of your living area completely by installing a storage loft. While bedroom lofts are the most common design, storage lofts are a close second. It solves the problem of finding extra square footage for storage by creating a new room in your tiny house. One of the biggest reasons that people decide on a tiny home is for the eco friendly benefits. Many traditional homeowners have also started to incorporate eco friendly home designs in their houses as well. Not only do these designs reduce waste, but they also have proven to be cost effective in the long run. 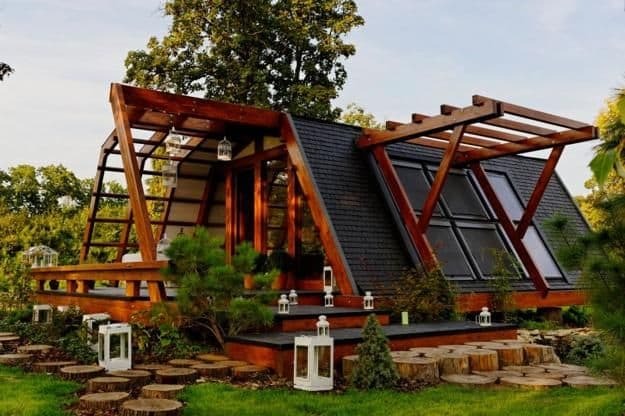 If you’re designing your own tiny house, you can incorporate different building materials and home structures to support your eco friendly homes. Tiny cob homes are made from a combination of clay, sand, and straw. Not only is it durable, but it can also act as a natural insulator. The most common way that people incorporate eco friendly ideas into their homes is through their choice of utilities. While large windows and good insulators do a large portion of your heating and cooling, programmable thermostats can help you to regulate your tiny house’s temperature effectively. One of the easiest utilities to manage is an eco friendly rain water harvesting system. You can’t use this harvested water for drinking purposes, but you can use it for many other things that tend to take up a large portion of your water bill, such as a laundry. Designing and building your own home can be intimidating, no matter what size it is. This guide helps you to design your own tiny house with your most important considerations at the forefront. Whether you want to maximize your interior space with a loft and spiral stair or you want to have a completely eco friendly home, you can find the solution here!